It's finally here - Grab for Work. Grab for Work is the new service from Grab Philippines. It is a corporate transport solution that allows you to enjoy business transportation cost savings, while improving productivity for your company across Greater Metro Manila and the following major provinces in the Philippines: Cebu, Davao, Bacolod, Iloilo, Baguio and Cagayan de Oro. Free employees from having to manually declare each claim post-trip and dealing with lost or faded receipts. Digital receipts with trip details are sent straight to your employees’ inboxes, ready for submission, making Administration a breeze. 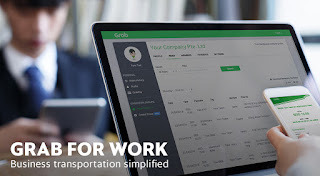 Grab for Work is also fully integrated with the travel expense platform, Concur. Your employees can link the two apps together and submit their e-receipts for claims directly to their Concur app. Grab has the largest fleet of vehicles in Southeast Asia. From bikes, taxis, private cars, premium cars to 6-seaters for all your business needs. The competitive GrabCar prices, with our transparent fixed fare guarantee, will maximize your cost savings. Your employees can pay for their rides using corporate credit cards, personal credit cards, debit cards and even cash. Grab for Work accepts them all to fit into your claims process. Looking for a monthly direct billing plan? Get in touch with the Grab Sales Team. Grab for Work provides consolidated statements for all business rides, letting you know where and when your employees are travelling. This allows you to keep track of your company’s cash flow and analyse the travel behavior of your employees, enabling you to set the right transportation policies for your business. To know more about this, you may visit Grab site here.